It’s kind of odd to read that from a fitness expert, huh? I have news for you… it’s the truth. If you’ve followed me for any length of time then you know I’m a straight shooter. I tell it like it is and refuse to sell you a fantasy about true health. Is working out good for you? ABSOLUTELY. Is working out a good habit to cultivate? MOST DEFINITELY. Will working out help you lose weight? YES. Do I recommend working out? SURE DO. Will it get you to your weight loss goals? NO. At least it won’t get you there without one other thing… and that is NUTRITION. You’ve heard the saying that weight loss is 80% nutrition and 20% working out. I agree with that. And yes, I realize it may sound odd to have a fitness professional telling you that working out counts for only 20% of your success, but that’s reality. You can’t eat salty, sugary, and bad fatty foods and expect to reach your weight loss goals. You just can’t. This is one of the reasons why nutrition is part of my programs. We can get you active, we can get you moving, we can get you feeling alive during our sessions together… but we can’t reach your ultimate goals without giving your body the food it needs to thrive. Eating the right things can be confusing. There are so many different views on this and it seems like one diet conflicts with another. This is why I don’t believe in dieting – I know that sounds cliché but it’s the truth. You can’t diet through life. You have to eat and enjoy it. You have to love your food and feel as though it’s allowing you to heal and thrive. Being on a restrictive diet doesn’t let you enjoy your food completely. Most of them cut foods out that you love and that’s when the cravings start. Instead of diet, think eating healthier. Notice how I’m not saying eat only healthy food, just healthier. I’m sure we can all agree that we could eat better. Incorporate more veggies, eat fresh fruit, drink more water and limit sugary beverages. Your eating doesn’t have to be perfect, just a little bit better each day. Soon, it will become a habit and you’ll be eating healthier, feeling better, and looking slimmer. Sure, there will be those times that you’ll have that piece of cake, but like I said, you’ve got to enjoy your food too. I know you’re sick of gaining the extra weight each year. I know you’re sick of feeling bloated. I know you’re sick of working out on your own and not seeing the results. Let’s end that depressing game and get you motivated to reach your ultimate goal – looking great, feeling great, and being proud of who you are. 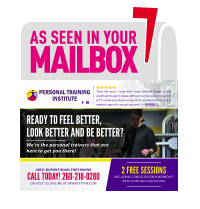 Give us a call at 260-338-2022 for a FREE CONSULTATION and we’ll help you get active, eat better, and most of all, feeling better.